Back in the year 1610 (or perhaps it was 1611), a fellow by the name of Bill Shakespeare wrote a little play called “The Tempest“. Years later, in 1956, a ground-breaking science fiction film “Forbidden Planet” emerged that drew upon some elements of “The Tempest“. Still later, in the mid-1980s, a production emerged in London that explicitly combined even more elements and characters from “The Tempest” with the basic storyline of “Forbidden Planet“, adding in Iambic Pentameter-ish dialogue from not only The Tempest, but numerous other Shakespeare works. This was intended as a musical, and so it added to this structure numerous rock and roll hits from the 1950s through 1960s, including “Great Balls of Fire”, “Teenager in Love”, “Gloria”, “Shake, Rattle and Roll”, and much more. The resulting musical won the Oliver award in London in 1989 (beating Miss Saigon), and is just about to be revived on the London stage for a 25th Anniversary UK Tour. But you don’t need to go as far a London to see this show; you only need to go a few minutes North of Los Angeles to the community of Newhall in Santa Clarita, where Repertory East Playhouse is presenting the musical “Return to the Forbidden Planet“. Now, I knew none of this backstory when we got our tickets for this show. We’re season subscribers to REP, and when O announced the season back in late 2013 and I saw this show, I went “huh?”. REP normally has a summer musical, and this didn’t appear to be one. I thought, perhaps, that “I Love You, You’re Perfect, Now Change” had stolen the musical space and this was just a simple parody. So I researched the show, picked up the original cast album, and gave it a listen. I was very surprised: here were a number of great songs from the 50s and 60s arranged to tell a science fiction story. I began to look forward to this show. The answer, of course, is “Either way, Daddy-O, as long as it swings! Scooby Doo!”… and REP came out swinging. This was one of the best REP productions I’ve seen: a combination of live music (a first for any REP musical), great singing, actors who just having fun with their roles (which I always claim ups the amplification — something Ghost needed to learn), and a spectacular set. REP is having fun here, and that fun is shared with the audience. It begins when you enter the theatre and hit the bar — which was serving “Tempest in a Tumbler”. It continued when you entered the auditorium and saw the spaceship set… which when you looked closely integrated car stereos, a Darth Vader Pez dispenser, an early (working) Apple ][C monitor, a radar range, hidden “81”s everywhere, and incredibly hilarious labels on everything. The show begins… not with the usual prerecorded announcement, but with the cast coming out in character to warn against cell phones, demonstrate the exits in the manner of flight attendance, and teach the audience participation cues. The pop culture references began here, and didn’t let down. Hint: Never wear a red shirt on a spaceship bridge and forget to turn off your cell phone. Then the prerecorded narrator announcements come on, and the iambic pentameter begin with the story proper. At this point, you’re going: OK, now I’m going to get a group telling the traditional Tempest in a science-fiction mileau… but then you notice that the language is conflating many Shakespeare shows, and you start seeing the actors doing 60s songs such as “Wipeout” or “It’s a Man’s World”. You’re not in Kansas anymore. The plot follows the crew of a routine survey flight under the command of Captain Tempest. After takeoff, Captain Tempest converses with the ships new Science Officer, who is a woman, and they argue about the importance of men and women on earth. During their argument, the ship gets caught in a meteor shower. The Science Officer suggests that they use the shuttle craft and abandon ship, but Captain Tempest insists on flying through the storm. During the confusion the Science Officer escapes the ship via shuttle craft. Their spaceship is drawn mysteriously to the planet D’Illyria where the crew meet mad scientist Doctor Prospero, who has been marooned on the planet since his wife, and science partner Gloria sent him and their daughter Miranda into space. Doctor Prospero offers to help repair the broken starship and he, his daughter, and their robot Ariel come aboard. The ships cook, Cookie is instantly taken by Miranda’s beauty and falls in love with her, a love he thinks she returns. In fact she has fallen in love with Captain Tempest, against the will of her father. During discussions about locating the missing Science Officer, Ariel reveals information about Doctor Prospero’s new formula ‘X Factor’, which can enhance the brain and mind. After an argument with his daughter over her love for the captain, Doctor Prospero takes the draught of ‘X Factor’. Soon afterwards, the ship is attacked by a foul monster, but during the attack it is revealed that Ariel is in the airlock with the missing Science Officer. To save them both, Captain Tempest orders the airlock opened, which allows the monster to gain access to the ship. During the confusion of the attack it is revealed that the Science Officer is Doctor Prospero’s wife Gloria, who is then taken by the monster, as its tentacles attack the rest of the ship. The story continues with the attack unfolding again, but this time Gloria isn’t kidnapped by the monster, and Ariel the robot is able to attack the monster to make it retreat. After the attack, more is revealed about Doctor Prospero and Gloria’s past. Captain Tempest puts Gloria under ship arrest for her crimes against her husband. She forms a quick alliance with Cookie, whom she persuades to release her and help steal the recipe for Doctor Prospero’s ‘X Factor’ in exchange for helping him win over Miranda’s heart. Gloria talks to Cookie, as Bosun, the ships First Mate, talks to Captain Tempest about how to gain the love of Miranda. It is then revealed when the monster returns that it is created by Doctor Prospero’s mind due to him taking the ‘X Factor’. Gloria tells Doctor Prospero that what she did to him was so that he could keep himself and their daughter safe from the ‘X Factor’. Doctor Prospero has no choice but to leave the ship and sacrifice himself to save the others. Once Doctor Prospero has left, it is then revealed that D’Illyria is nothing other than a figment of Doctor Prospero’s imagination, as it starts to destroy itself once the doctor has died. The ship escapes and when once again in space Gloria blesses the union of Miranda and Captain Tempest, and Cookie is pardoned for his behaviour towards Miranda and Captain Tempest. The show ends with the entire crew safe and well with their Science Officer back and Captain Tempest with a new bride. As I said above, REP executed this every well. There was strong casting, strong visuals (including great graphics), strong singing, and fun. Credit for this goes to the director, Rick Pratt (FB), who pulled the large cast together and provided a great creative vision for the show (as well as playing keyboard during the show in an outfit that made me think of Paul Revere and the Raiders, with the ruffled dickie). Rereading his bio just now, I should have known we were in for fun — this fellow was a musical director at the Moorpark Melodrama during its heyday in the 1980s. The show was also a family affair, as his wife and son were in the show. Casting was very strong. My personal favorite, out of all of the cast, was Beth Ann Sweezer (FB) as Ariel the robot. This young lady was out on stage, on roller skates, in a silver skin-tight costume with silver make-up, in a performance that could have easily been very, umm, mechanical. Instead, her face was a joy to behold — expressive, playful, shining — and her movements (especially when you realize this was all done on skates) were fun to watch. That’s acting and dance talent, which was then combined with some wonderful singing (including a wonderful rap performance). Her bio shows we’ve seen her at REP before, and checking out what I wrote, I see she was also my favorite in The Great American Trailer Park Musical. I look forward to seeing her in more REP shows, and hopefully in other productions in Southern California. Moving from my favorite to the lead positions. As Captain Tempest, Benjamin Patrick Thomas (FB) brought a handsome bravado and a strong singing voice to the leadership of crew of the Starship 81. He handled his numbers, and the iambic pentameter, quite well. As Gloria, the Science Officer, Lori D’itri (FB) brought strong singing chops and dance moves to the role. Lori is another REP musical regular — we saw here in both Trailer Park and The Full Monty, as well as being a Goldie Award winner for her performance in Dixie Swim Club at CTG. The last lead player was Mike Davies as Prospero. Davies handled the role with good singing and lots of humor; I particularly enjoyed his epilogue of “Monster Mash”. In the middle positions were Connor Pratt/FB as Cookie and Alina Bock (Actor FB, Personal FB) as Miranda. Pratt’s Cookie captured the stoner surfer stereotype quite well, and he sang quite well. What was more surprising for Pratt was that, unlike other actors who faked playing guitars in a scene or two, Pratt actually played his guitar — it was plugged into the sound system, and he had quite a few solos he handled well. Don’t believe me: watch his fingers on both the strings and the frets. Very nice. Bock’s Miranda was beautiful and she had a wonderful singing voice… plus at the end she was dancing in the odd costume out of a Madonna musical in these ridiculously high stilettos. I don’t know how women do it–I don’t think a man could take it. Rounding out the cast were Tara George as the Navigation Officer, Rodnesha Green (FB, G+) as the Bosun (and vocal director), as Sandra Pratt/FB as the Newscaster (and presumably the opening red-shirt). I was originally unsure about George — I detected some form of accent (later I figured it out as middle-eastern), and she seemed a bit cold. I think that was her character — she sang very strong in her numbers. Pratt was also strong in her numbers, in her interactions with Ariel, and I enjoyed her fiddling with her buttons and switches, as well as her popping of the Valium. Lastly, the third Pratt (Sandra) was strong and fun to watch in the interstitial narrations. This is the first time, I also get to talk about the on-stage band. After all these years, they finally found a way to get Nanook/FB out of the sound booth: put him onstage with a guitar! He was joined by the director, Rick Pratt (FB), on keyboards; Art Gibson on bass, and David Goldberg on drums. It was truly wonderful to have live music at REP, although it was clear that the band was keeping things a little on the softer side so that they did not overpower that actors. I’m sure that as REP does more live music, they will find the correct balance for the facility. It was a great start. Choreography was by Kristen Pechacek (FB), who did a great job of making the movement work well on the small REP stage. She also coordinated the movement well for Ariel on roller skates and Miranda’s dancing in the stilettos. It was actually one of the better choreography jobs I’ve seen over the years at REP. Turning to the technical side of things: The scenic design by Frank Rock/FB and Jeff Hyde/FB, was a hoot (as I noted before). Integrating multiple monitors, a Radarrange, a Mr. Coffee, and Apple ][C (working), and all sorts of knobs and switches — it was just fun to look at for all the little technical details and in-jokes (in particular, note that the transporter has the large label LXXXI, which happens to be the number 81, REP’s theme number). You can see a photo of the set and cast here. These were supported by Marlowe Weisman (FB) and Sandra Pratt/FB did a wonderful job with the props, including a large Darth Vader PEZ dispenser. Tim Christianson/FB‘s lighting was as strong as ever, including some LED strobes I haven’t seen before. Tim also did the wonderful puppet used at the end of act I. The videos designed by the director, Rick Pratt (FB), worked very well. Costume design was by Sandra Pratt/FB, assisted by Flo Loring (FB): the costumes worked well and looked appropriately science-fiction-y. As noted earlier, I particularly liked Ariel (Beth Ann Sweezer)’s robot costume, and Miranda (Alina Bock)’s final costume was a nice homage. Steven “Nanook” Burkholder/FB did sound, as usual; this was the first time I’ve seen wireless mics taped to the actors at the REP; I could hardly notice they were on. Whether this was intentional, or if Nanook is still trying to find the right balance between the band and actors is unknown. Kim Iosue/FB was the stage manager, assisted by Vanessa Reyes. “Return to the Forbidden Planet” was produced by Mikee Schwinn/FB and Ovington Michael Owston (FB). 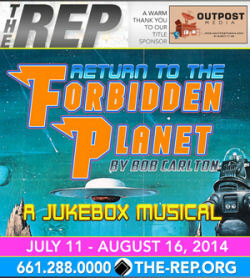 “Return to the Forbidden Planet” continues at Repertory East (FB)until August 16. Tickets are available through the REP East Online Box Office, as well as through Goldstar. “Planet” will be followed by the limited run “Exit 81” production of “An Adult Evening of Shel Silverstein” on the weekends of August 22 and August 30. The next REP full production is “The Great Gatsby“, running September 12 through October 18, 2014. Upcoming Theatre and Concerts: Next weekend sees us back at the Pantages (FB) for “Once” on 7/19. The next weekend brings “Bye Bye Birdie” at Cabrillo Music Theatre (FB) on 7/26, hopefully followed by the annual Operaworks improv show on 7/27. August has gotten busy: it starts with “Family Planning” at The Colony Theatre (FB) on 8/2. This is followed by “Buyer and Cellar” at the Mark Taper Forum on 8/9, and “Broadway Bound” at the Odyssey on 8/16 (directed by Jason Alexander). The following weekend we’ll be in Escondido, where there are a number of potential productions… including “Two Gentlemen of Verona” at the Old Globe, and “Pageant” at the Cygnet in Old Town. What they have at the Welk (“Oklahoma“), Patio Theatre (“Fiddler on the Roof“), and Moonlight Stage (“My Fair Lady“) are all retreads. August will end with the aforementioned “An Adult Evening of Shel Silverstein” at REP East (FB). I’m just starting to fill out September and October — so far, the plans include “The Great Gatsby” at REP, “What I Learned in Paris” at the Colony, and “Pippin” at the Pantages. More on that later. As always, I’m keeping my eyes open for interesting productions mentioned on sites such as Bitter-Lemons, and Musicals in LA, as well as productions I see on Goldstar, LA Stage Tix, Plays411. Your review was informative and quite extensive. Have you tried having the local newspapers to print it? I enjoyed the play tremendously. It is a great combination of “the Bard” and “Rock ‘N Roll” music. Especially, enjoyed Cookie, Gloria and Prospero. I’m not a formal critic, so they tend not to print things from me. I am, however, picked up as one of the reviewers that feed into the Bitter Lemons calculations (http://losangeles.bitter-lemons.com/); the problem is, we need 3 reviews of the show. So let’s encourage some other reviewers to come out and see the show! They’ll go south to Anaheim, but not north to Newhall.